We met up with C and S for some pho… on an incredibly warm and muggy day. C’s a big fan of Pho 75, so we went there. I’d never been there before. Since C is half vietnamese, I trusted his pho tastes. Pho 75 serves pho only. That’s right folks, no rice plates or vermicelli or spring rolls. Just pho, and a few drinks, and some scary looking technicolor desserts. If you don’t want just pho, then move along. Despite having a couple of asians along for the party, we all got very safe pho bowls, with safe meats… steaks, briskets, flanks. Not an innard to be had between any of us. They serve a hearty bowl of pho here. The broth is actually a bit stronger than any of the other places I’ve been to in philly, and I’ve been to quite a number of them. So if you’re looking for a stronger flavored broth, Pho 75 is your place! Everyone agreed that the meat quality here is superior. For the healthy ones with us, they liked that it was less fatty than other places. And it seemed that you get more meat than at other places. We all stuffed our gourds. 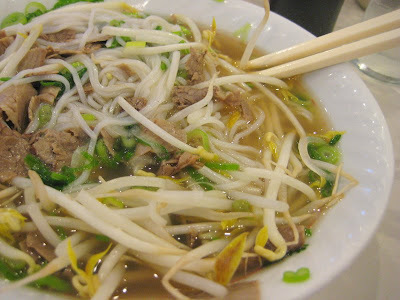 I usually bastardize my pho with a giant heaping of sprouts and a few little squirts of sriracha and hoisin sauce. That’s usually it. I don’t put in jalapenos, and I normally don’t squeeze any lime. But C did the lime. And he doesn’t know why he does it but he does it cuz his mom does it and she’s vietnamese. So J and I both followed suit and limed our pho this time. We both liked it. Just a little squeeze. I can’t explain how it changed the pho, but it made it a little bit better. I’m convinced. It was a good, filling, and cheap meal. The only down side is that on this hot and muggy night, all the windows were closed and there was no a/c on at all, so it was just uncomfortable. And it was also eerily deserted. There were a few people there when we showed up, but by the time we left, it was just us. Perhaps they just close early? Or perhaps real pho eaters don’t eat pho for dinner? I don’t know, but it was slightly weird. Oh, and they’re cash only. Considering the upcoming weather, I’m not sure how much more pho I’ll be eating until it gets cold again!